The world’s most influential airport commercial revenues conference, the Trinity Forum, will be held in Doha in 2019, the first time the event has ever been hosted in Qatar. The conference, organized by The Moodie Davitt Report, ACI World and ACI Asia-Pacific, will be hosted by Hamad International Airport (HIA), Qatar Airways and Qatar Duty Free (QDF) and will take place in Doha from 30-31 October 2019. 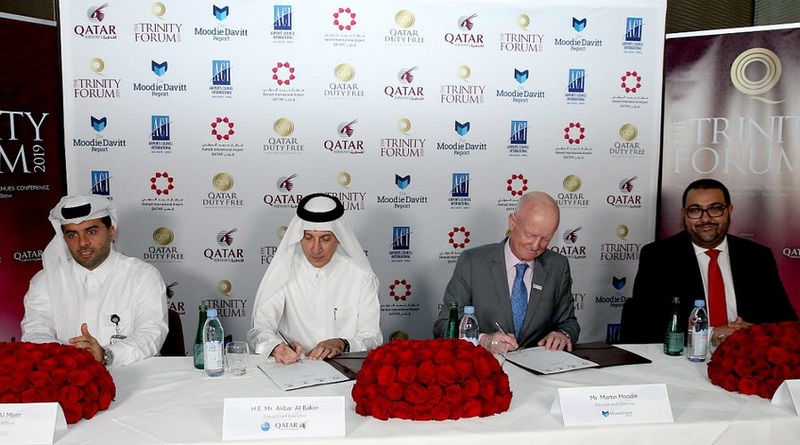 Qatar Airways Group Chief Executive, His Excellency Mr. Akbar Al Baker and The Moodie Davitt Report Founder and Chairman, Mr. Martin Moodie, signed the partnership agreement for the event in the presence of Hamad International Airport Chief Operating Officer, Engr. Badr Mohammed Al Meer and Qatar Duty Free Vice President Operations, Mr. Thabet Musleh. Qatar Duty Free Vice President Operations, Mr. Thabet Musleh, said: “Hosting the Trinity Forum in Qatar for the first time reflects our ongoing commitment to retail innovation and excellence. At Qatar Duty Free, we work hard to enhance the passenger experience in everything that we do, and work closely with all our brands and partners to continuously innovate to create lasting and memorable experiences. The Moodie Davitt Report Founder and Chairman, Mr. Martin Moodie, said: “We are delighted to bring the Trinity Forum, the world’s most influential airport commercial revenues conference, to the Middle East region and, in particular, to Qatar, a shining example of the pursuit of airport retail and commercial excellence. Hamad International Airport is one of the world’s great airports, and Qatar Airways is one of modern aviation’s most extraordinary success stories. We are proud to partner with such outstanding organizations and with Qatar Duty Free, which so epitomizes our industry’s drive for retail and consumer service excellence. “Since its launch in 2003, the Trinity Forum has grown from strength-to-strength with each edition. The most recent event, held in Shanghai, saw record attendance and was testimony to the importance all sectors of the industry place on the need for a Forum which champions collaboration, innovation and excellence, debates key issues and questions industry shortcomings. We have exciting plans to grow the event in 2019, including an extended focus on food and beverage, as well as the changing face of airport retail and other consumer services. The second-largest duty free operator in the Middle East, QDF boasts more than 90 elegant boutiques and luxury, high-end stores, as well as more than 30 restaurants and cafés covering an area of 40,000 square meters at HIA, providing travelers with a world-class shopping experience under one roof. Luxury brands also available at the five-star airport include Tiffany & Co., Gucci, Bulgari, Hermès, Burberry, Moncler, Rolex and Harrods. In addition, the award-winning duty-free retailer regularly showcases podiums and pop-up stores, including the most recent DIOR LES PARFUMS podium, a TUMI pop-up store, the L’Oréal Grand Hotel Podium and the Prada Voyage Podium. Qatar Duty Free was awarded ‘Airport Retailer of the Year’ at the 2018 DFNI Global Awards. In April, the leading airport retailer was recognized at the PAX International Readership Awards, when Qatar Airways won ‘Best In-Flight Duty-Free Program’ for the Middle East and Africa and was acknowledged as an industry leader for its outstanding in-flight duty-free service, which is operated by Qatar Duty Free. HIA the home of QDF, has already met several significant milestones in 2018, including being ranked fifth ‘Best Airport in the World’, fourth ‘Best Airport for Shopping’ and fifth ‘Best Airport for Dining’ at the Skytrax World Airport Awards 2018. HIA is the only airport in the Middle East to be ranked in the world’s top 10 airports of 2018. At the annual awards ceremony, HIA also took home the title of ‘Best Airport in the Middle East’ for the fourth year in a row, and ‘Best Staff Service in the Middle East’ for the third consecutive year.